The Marquette County Sheriff’s Office is investigating a one-vehicle crash that occurred between a large delivery truck and a railroad overpass. Edward Beauchamp, 60, of Negaunee was driving a 1996 Oshkosh utility truck when he entered the highway just east of the railroad overpass along U.S. 41. The vehicle’s utility boom struck the overpass and dislodged from the truck and landed onto the road. The driver had just loaded concrete K-rails and thought the boom was low enough but later hit the bridge after entering the road. Beauchamp was cited for being over height. Michigan State Police and Michigan State Police Motor Carrier Officers assisted on the scene. NEGAUNEE TOWNSHIP — Traffic is down to one lane on US-41 in Negaunee Township as police and other officials investigate an accident involving a truck and a railroad overpass. The accident occurred just after 1:00 p.m. near Associated Contractors. 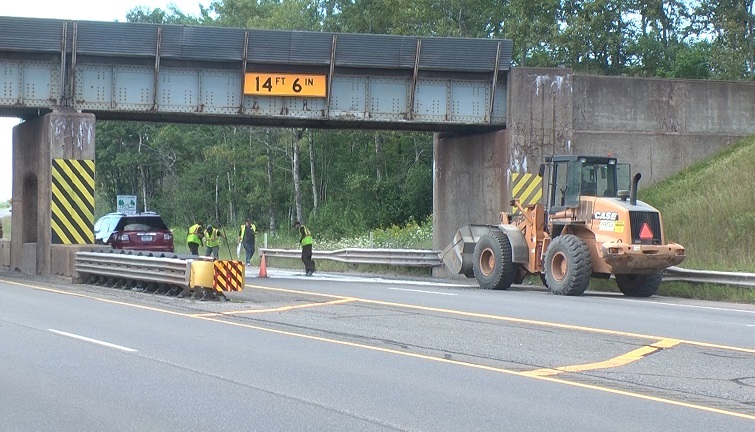 The Marquette County Sheriff’s Office tells ABC 10 an Associated Contractors truck turned westbound onto the highway and a portion of its crane and hooked onto the bridge portion of the railroad. The collision ripped the crane off the truck. No injuries were reported. The Marquette County Road Commission and railroad officials have been contacted to inspect the area. At this time, the accident remains under investigation. Snowmobiler injured in Schoolcraft Co.